Pt’eros is the protagonist of Kuzimu. He is not a hero, nor is he on his journey willingly. The world of the dead is one of the mind and the imagination, so the memories of his life as a Maasai tribesman, his dreams, his nightmares exist as if alive. Though dead, his life will not let him rest. His unique ability to traverse the divides of life and death make him the target of the warring races and predators that inhabit the spirit realm. Find out more at – http://www.kuzimu.co.uk. The Memmumium, self-appointed rulers of the afterlife, are but one of the numerous forces that will pursue and hinder Pt’eros. In a world composed of everyone’s memories, delusions and fears, the madness is only abated by finding faith in something. For the Memmumium, it is that logic and technology will eliminate suffering. In forcing others to ‘convert’ to their grand cause, they believe that they are saving humanity from its own brutality and darkness. 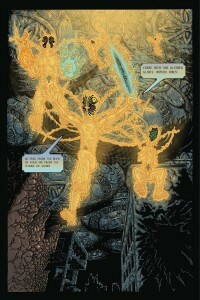 Read the first five issues at http://graphicly.com. The Mu-zimu are a ragtag of frightened souls, caught in their own sorrow and insanity. Trapped in darkness below the Memmumium’s iron celling, they have grouped together in system of belief that worships bodily deconstruction and fear. It is their belief that by defeating their fear and overcoming the illusion of having form, they can escape into the peace of oblivion. To this end, they are entering into a war with the Memmumium for their spirits and the right to a choice. Published by 215 Ink. 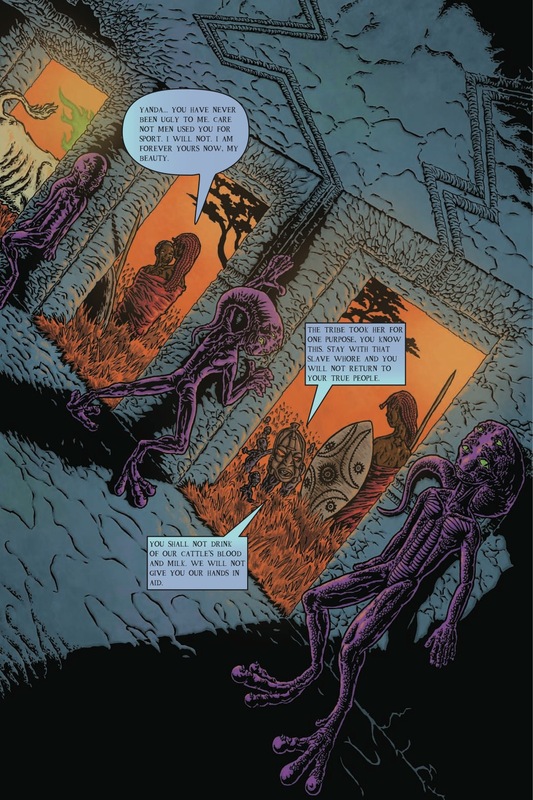 Kuzimu, the graphic novel in print (issues 1-7 plus extra artwork) can be ordered from TFAW.com, Page45.com, Archonia.com, and ForbiddenPlanet.com. This entry was posted in Columns and tagged archonia, archonia.com, forbidden planet, forbiddenplane.com, kuzimu, page 45, page45.com, tfaw.com. Bookmark the permalink. Follow any comments here with the RSS feed for this post. Post a comment or leave a trackback: Trackback URL.